There’s an awesome little street wear sale happening this coming weekend near Westbourne Park. 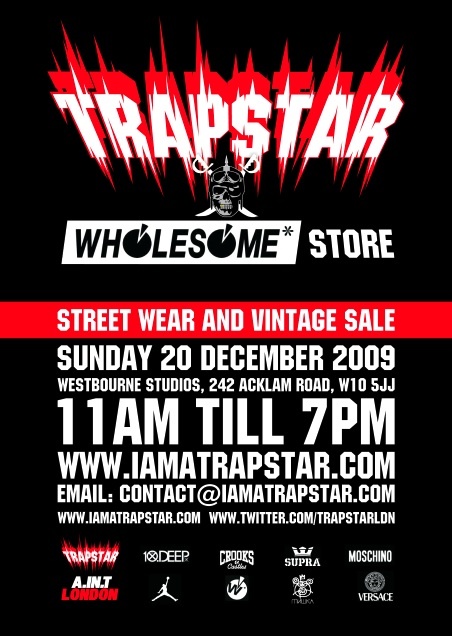 In a similar fashion to the Off The Radar event held earlier in the year, the Trapstar team have gotten together with the people of new London store Wholesome, to put on a one day sale at Westbourne Studios. As well as staples of street wear game like 10 Deep, Crooks & Castles and Mishka, the sale features Trapster themselves, as well as fellow London brand A.In.T. You’ll also be able to grab something a little bit different with items from Jordan brand and Moschino, it looks like it’s gonna be a good one so I’d recommend heading down there during the day to check it out. Check out the Trapstar 2020 Vision video above for more information on East London’s newest store, Wholesome. For more info on the street wear sale, peep the flyer below.